Chris Piper put a very rare Nitzer Ebb homevideo of the early years on his YouTube channel. Chris put this video together back in ’84 or thereabouts. It features clips from a couple of their early gigs along with some library footage he had access to at the time. Join Chris’ YouTube Channel and enjoy! Watch a new video on the official NEP YouTube Channel. It’s Kloq’s live version of the classic Nitzer Ebb Track Blood Money with special guest Douglas McCarthy. 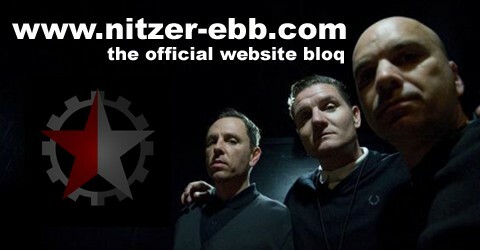 Nitzer Ebb are confirmed for this years Wave Gotik Treffen in Leipzig / Germany on June 13th, 2011. Get all information about the venue on the WGT festival area and buy tickets at the official festival website. The 2011 Wave Gotik Treffen take place from 10th till 13th of June 2011. The next live date on NEP 2011 tour schedule is confirmed now: Utrecht in the Netherlands on July 30th, 2011. The Ebb will play at the Summer Darkness Festival. Nitzer Ebb are confirmed to play a show in Salzburg / Austria at B-Lack. The show will take place on the 06th of May, 2011.